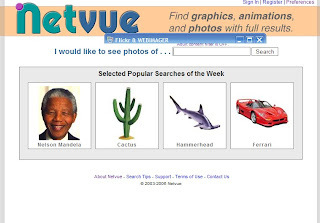 Netvue is an image search site, that allows you to search the internet for graphics, clipart, and photos. It has a good feature that is slide show of result, and you can also see full size of image. It is a really cool image search site, and with some nice features. Actually, I do not want say it too much, you can look at Netvue how it works.